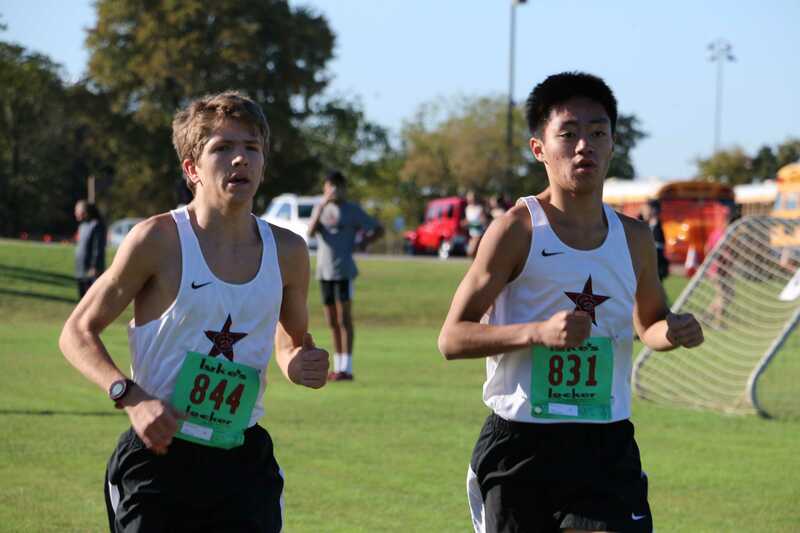 Coppell High School juniors Nathan Sims (left) and Alan Huo (right) run neck and neck at the District 7-6A Championship meet at Bob Jones Park in Southlake on Oct. 19. Sims placed sixth, right behind Huo who placed fifth. For Sims and Huo, this seasons meet results were a constant back and forth between placing above the other. Photo courtesy Tamera Westervelt. Early to rise, late to bed, Coppell High School junior and varsity cross country captain Nathan Sims runs on ambition and self discipline from the moment he wakes up at 5:30 a.m. for cross country practice, to 10:30 p.m. when he falls asleep after an evening full of homework, waiting to start it all over again. Sims discovered his passion for long distance running in seventh grade while in Coppell Middle School North’s athletic program. Since freshman year, Nathan has been a part of the Coppell High School cross country team, each year progressing in his running abilities. Upon assuming the role of a varsity captain as a junior, Nathan’s views of the cross country team began to change. First year cross country coach Nick Benton already sees Nathan’s effectiveness as a leader in the short time he has been a coach at CHS. Not only is Nathan managing this important role of being a varsity cross country captain, but he is also an exemplary student. Nathan is taking three Advanced Placement (AP) classes as well as a dual credit U.S. History class at North Lake Community College, and exceeding in all of them. Two days out of the week, Nathan is also tutoring a student on geometry. What aids in Nathan’s ability to balance both tasks is his self-discipline. To help keep Nathan on track, his parents are proactive with his busy schedule. Nathan’s parents support him in all his endeavors, but try to focus on the present rather than look forward to the future. For this cross country season, Nathan has high hopes both for himself and for the rest of his team. Huo is a junior and varsity cross country runner at CHS. He has been greatly impacted by Nathan’s leadership. Nathan’s positivity and optimism has really aided him in managing his hardest year of high school and lead role on the cross country team.